I must say I really like Fuse’s diagrams (as if you hadn’t noticed that already…) and this shell is just so easy to fold and results in a very cute “shape”. I mean it’s spiraled, it’s 3D and has that cuteness and beauty of the real shells. Oh the name of this shell is 風化した貝 which I don’t know how to exactly translate so spiral shellfish it is… A note: I think it translates into weathered shellfish but I don’t know if that name is widely known or not so bear with the lame translation. This entry was posted on 2007|02|11 at 08:55 and is filed under modular origami. You can follow any responses to this entry through the RSS 2.0 feed. You can leave a response, or trackback from your own site. Hi! I’m mawar. 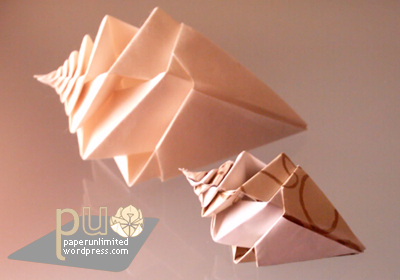 the spiral shell origami was very unique and beautiful Could you share the diagram of the spiral shell with me? I’m new in the origami world. thank you. Hi, Is there any video or Diag for this spiral ? Ohh! that shell looks amazing! I wish you could share diagrams…please!!! I was looking for shells while searching for something to fold for a project and I found that yours looked more like something you find on the beach. I absolutely LOVE it!!! can you please share the diagram with me? Ever since I received a shell just like the one above in the mail last year, I’ve been obsessed with it. I just now have come across your beautiful site and would love to know how to do it myself so I can pass on the favor this year for Christmas. You don’t know what it would mean to mean if you could share this diagram for this beautiful shell. I want a diagram too!!!!! plz!!!! !